September 27, 2011 Leighton M. & Friends Bob & Paul from Auston Tx. Catch a Mess of Lake Calcasieu Specks on their First Trip!!! September 27, 2011 Leighton M. & Friends Bob & Paul from Auston Tx. Catch a Mess of Lake Calcasieu Specks on their First Trip!!! It was on from first light with Gulp Swimming Mullet under a Cork and Gulp Shrimp filling the Cooler with nice Speckeled Trout and some Big Lake Bronze Beauties too!!! 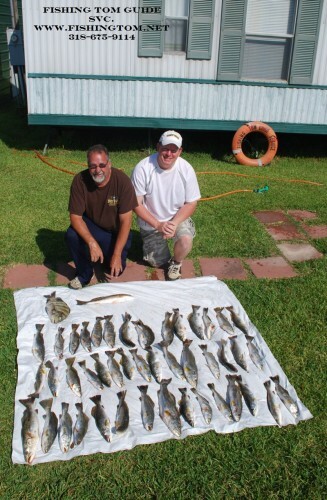 September 23, 2011 Kyle F. & Ben S. Catch a Lake Calcasieu Limit of Nice Trout!!! 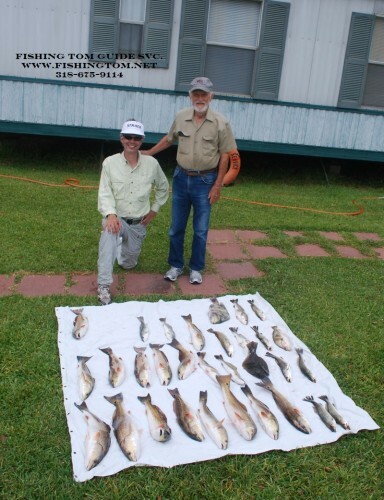 September 23, 2011 Kyle F. & Ben S. Catch a Lake Calcasieu Limit of Nice Trout!!! Gulp Swimming Mullet under a cork put most of these beauties in the cooler but Gulp Pearl Shrimp also put it’s fair share in as well! It was an early bite with 30 caught by 8 am but we had to move and look to finally find some birds and finish our Limit!!! September 18,2011 Uncle Hank (At 84) Comes Out Of Retirement to Show His Nephew Leighton How to Catch a Limit of Big Lake Bronze Beauties!!! September 18,2011 Uncle Hank (At 84) Comes Out Of Retirement to Show His Nephew Leighton How to Catch a Limit of Big Lake Bronze Beauties!!! Live Shrimp under a popping cork had Uncle Hank putting a Big Red in the Box on almost every cast. I think 84 is the new 60!!! September 17,2011 It was Ladies Day on Big Lake for Sandra D. Along with Husband Jude and Friend Huey She filled the cooler with just a little help from Captain Tom!!! 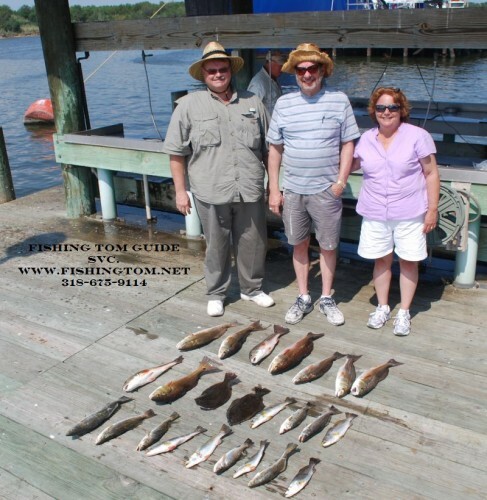 September 17,2011 It was Ladies Day on Big Lake for Sandra D. Along with Husband Jude and Friend Huey She filled the cooler with just a little help from Captain Tom!!! 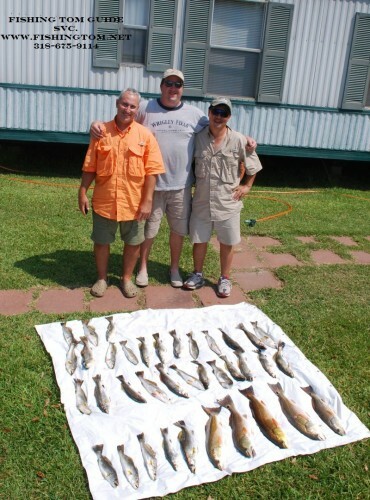 Live Calcasieu Point Shrimp and Gulp helped these guys (And Gal) Have a great Fishing Adventure on Lake Calcasieu!!! September 15,2011 Mike E. & FriendsFill the Boat with Lake Calcasieu Silver Beauties!!! 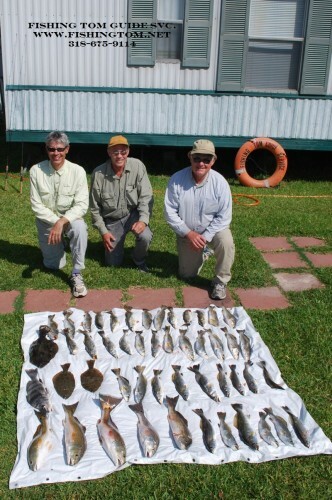 September 15,2011 Mike E. & Friends Fill the Boat with Lake Calcasieu Silver Beauties!! Gulp & Live Shrimp left them just 3 short of A Big Lake Limit!!! Plus some nice Reds for a great day on the water! 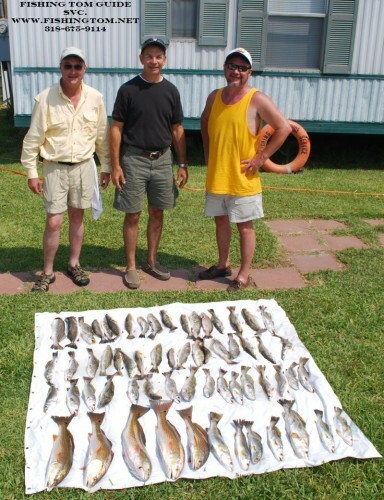 September 9 2011 Howard L. & Friends Dennis and Kurt Boat a Mess of Big Lake Beauties!!! September 9 2011 Howard L. & Friends Dennis and Kurt Boat a Mess of Big Lake Beauties!!! Both Gulp and Live worked great on Lake Calcasieu today to help these guys put a nice mess in the cooler!! !